If your Dutch immigrant ancestors travelled to Ellis Island, and you have located your immigrant ancestors on an Ellis Island passenger list, you usually have sufficient information to trace their roots in The Netherlands. To help you to get started, I have selected several Dutch Ellis Island immigrants, and searched for them in online genealogy databases and other genealogy websites. I have, more or less randomly, selected a page from an Ellis Island passenger list, and we will try to trace the Dutch families on this list into The Netherlands. The passenger list we will be looking at is the list of the S.S. Rijndam, sailing from Rotterdam on 8 April 1911, and arriving at Ellis Island ten days later (see partial transcription). There are thirty names on the page I selected, and 19 of them are Dutch: Antje Velthuizen, Neeltje Velthuizen, Barbara Velthuizen, Geertruida Velthuizen, Jeannette Velthuizen, Hendrika Velthuizen, Dirk Velthuizen, Willem B. Johannes de Munnik, Cornelia Maria de Munnik, Johan J. de Munnik, Julius W. de Munnik, Catharina Hendrika de Mey, Johannes Antoni van Aalst, Neeltje van Aalst, Pieter Velthuis, Sophia Pardoen, Franciscus van Valkenburg, Geertruida van Valkenburg, and Franciscus van Valkenburg. Antje Velthuizen (24, born Workum), Neeltje Velthuizen (29, born Numansdorp), Neeltje's children Barbara (4, born Scheveningen), Geertruida (3, born Rotterdam), Jannette (2, born Rotterdam) and Hendrika (1, born Rotterdam), and Dirk Velthuizen (17, born Workum). Last residence is Rotterdam. Contact in The Netherlands for Antje is her parents, H. Velthuizen in Rotterdam. For Neeltje, there is only a quotation mark in the contact field, for her children it is "grandparents", also with a quotation mark. Dirk's contact is "parents", again with a quotation mark. The destination of Neeltje and the children is Neeltje's husband D. Velthuizen in Paterson, NJ. Antje and Dirk are on their way to their uncle, Mr. J. Groenhof in Passaic NJ. Presumably Antje and Dirk are siblings, and Neeltje will be their sister in law. Workum birth records are on Genlias. I could not find any Velthuizen births in Workum, but after trying some spelling variants I discovered the birth acts of Antje Veldhuizen, born 31 January 1887, and Dirk Veldhuizen, born 8 May 1893, both children of Harmen Veldhuizen and Gelske Veenstra. I also found the births of three sisters, but no brother. There is also no marriage to be found of a son of Harmen and Gelske. As Neeltje's husband was already in the U.S., I searched the Ellis Island website for an arrival of a D. Veldhuizen or Velthuizen, and I found Dirk Veldhuizen, 31, born Charlois, on his way to his brother J.H. Veldhuizen in Paterson NJ, arriving on Ellis Island on 14 June 1910. Contact in The Netherlands is his wife N. Veldhuizen in Rotterdam. It looks like this could be the husband of Neeltje. But Dirk was born in Charlois (now a part of Rotterdam), which is nowhere near Workum, and it is unlikely any of Harmen Veldhuizen's children were born in Charlois. Apparently we were on the wrong track. Neeltje's first child Barbara was born in Scheveningen, a small village that was officially part of The Hague. She was 4 years old, so she was born in 1906 or 1907. The Hague births are online up to and including 1906, so maybe we are lucky and we can find her birth. Indeed, in the database of the The Hague city archive I found birth act 4165, dated 1 August 1906, describing the birth on 31 July 1906 in Scheveningen of Barbara Geertruida, daughter of Dirk Veldhuizen, 27, and Neeltje de Geus. It seems we're on the right track! I could not find the marriage of Dirk and Neeltje on Genlias, but on the website of the Rotterdam archive I found the marriage of Dirk Veldhuizen, 26, born Charlois, and Neeltje de Geus, 23, born Numansdorp, on 15 November 1905 in Rotterdam. Parents are Dirk Veldhuizen and Barbara Vermeulen, and Hendrik Abraham de Geus and Geertrui Touw. I tried, but failed, to find out whether Dirk and Neeltje and their children were related to Antje and Dirk. I suspect they are unrelated. In 2012 I received an e-mail by a relative of Dirk and Antje Veldhuizen. As far as he knows, they are unrelated to Dirk and Neeltje. He also sent me some additional information. Harmen Veldhuizen and Gelske Veenstra had ten children, five born in Workum and five in Rotterdam, where the family moved just before the turn of the century - including Dirk (born 8 May 1893) and Antje (born 31 January 1887). Dirk married in 1918 in Rotterdam, so apparently he moved back. Willem B. Johannes de Munnik (31, born in Rotterdam), his wife Cornelia Maria (30, born in Dordt), and their children Johan J. (4) and Julius W. (2, both born in Rotterdam). Last place of residence is Rotterdam. Contact in The Netherlands is Willem's father Johannes J. de Munnik, with an address in Rotterdam, destination is Cornelia Maria's brother J. Bakker. Note: Dordt is a common abbreviation of Dordrecht. It seems we should start our search in Rotterdam. The Rotterdam Archive has an excellent online database, and after some searching I found the marriage of Wilhelmus Bernardus Johannes de Munnik, 26, born in Rotterdam, and Neeltje Maria Böneker, 25, born in Dordrecht. The marriage took place on 24 January 1906. Knowing that Willem is a short form of Wilhelmus, and Neeltje is a short form of Cornelia, we may assume that this is the couple we are looking for. The parents are also named: Johannes Jacobus de Munnik and Antoinette Pank, and Friedrich Wilhelm Böneker and Juliana van Dijl. Note that the eldest child, Johan J., is named after his paternal grandfather. We can also find the birth act of Willem: Wilhelmus Bernardus Johannes de Munnik, son of Johannes Jacobus de Munnik and Antoinette Pank, born 2 May 1879 in Rotterdam. The birth and two marriages of Johannes Jacobus de Munnik are also available, as well as birth and marriage acts of several siblings of Willem. The surname of Cornelia Maria's brother (Bakker) raises some doubts. We should investigate why Cornelia Maria and her brother have different surnames, but I will not do that in this article. Catharina Hendrika de Mey (25, born Amsterdam). Last residence is Amsterdam, contact address is her father, Mr. A.G. de Mey in Amsterdam. She is on her way to Chicago, her contact there is G.J. Roozee, who is apparently not related. Our best bet is the collection gezinskaarten on the website of the Amsterdam city archive. There is no card for de Mey, but I know the letter y in a name on an Ellis Island ship record is often ij on Dutch records (see my article ij or y), and indeed there is a card for A.G. de Meij, born 22 July 1842. To get more information, I need to look at the scan of the gezinskaart, and to do that, I need to pay a fee. I paid the fee and downloaded the scan. It was difficult to read - the original gezinskaarten were lost in the second world war, and the scans were made from microfilms made by the LDS in the 1930s, so the quality is not what you expect from scans. Catharina Hendrika is listed on the card, with her parents and siblings. She was born 3 July 1885, probably in Amsterdam (that was hard to decipher). Her parents are Adrianus Gerardus de Meij (born 22 July 1822 in Maarssen) and Catharina Hendrika Kleinhuis (birth date and place hard to read). The family was catholic. The de Meij-Kleinhuis marriage is on Genlias: Adrianus Gerardus de Meij, 24, born in Maarssen, and Catharina Henderika Kleinhuis, 20, born in Wildervank, married on 24 April 1867 in Assen. Their parents are Gerrit Janszoon de Meij and Antje Sukel, and Jakobus Johannes Kleinhuis and Geertruida Geerts Ruberg. Johannes Antoni van Aalst (35, born Herwijnen), and his wife Neeltje (32, born Zaltbommel). Last residence is Zaltbommel, contact address is Johannes' father G. van Aalst in Herweinen. Zaltbommel marriages are in Genlias, and I could quickly locate their marriage act: Johannes Antonie van Aalst, born 30 September 1875 in Hurwenen, and Neeltje Cosijn, born 6 November 1876 in Zaltbommel, married on 25 January 1900 in Zaltbommel. Parents are Gerrit van Aalst and Klazina Hendrika de Vries, and Roelof Cosijn and Maria van de Graan. The groom and his father were farmers. The marriage of Gerrit van Aalst and Clazina Hendrika de Vries is also on Genlias, and probably other records of family members. Pieter Velthuis (30, born Zaltbommel). His last residence is Zaltbommel, and his contact address is Jan Velthuis in Zaltbommel. The same place of origin as the Van Aalst family, and also the same destination in Iowa. It is worth finding out what their relation is, but I won't do that in this article. Again, I had to try a different spelling to have any results. Searching Genlias I found Jan Veldhuis in Genlias, maybe this is Pieter's father: Jan Veldhuis, born 24 February 1844 in Terwolde (Voorst), and Allegonda Jansen, born on 11 February 1845 in Zaltbommel, married on 22 October 1870 in Zaltbommel. Parents are Derk Everds Veldhuis and Harmina Neusink, and Martinus Jansen and Willemina Maria Donkers. I checked Digital resources Netherlands and Belgium to see if there are any other resources for Zaltbommel, and I discovered that the Streekarchief Bommelerwaard has indexes to the birth register and the population register, among others. The birth register index lists Pieter Veldhuis, born 11 March 1881 in Zaltbommel. The population register index has the following family: Jan Veldhuis, born 24 February 1844, Allegonda Jansen, born 11 February 1845, Martinus Veldhuis, born 10 November 1872, Willem Veldhuis, born 6 January 1875, Pieter Veldhuis, born 11 March 1881, Antonia Wilhelmina Veldhuis, born 22 May 1885, Bertha Johanna Veldhuis, born 28 January 1888, and Johanna Cornelia Veldhuis, born 16 December 1891. It seems we're on the right track with this family, but we will need to visit the Bommelerwaard archive to prove it. The population register of Zaltbommel is kept there, and in it we can check if Pieter indeed left Zaltbommel in 1911. Sophia Pardoen (27, born Kampen). Last residence is Amsterdam, contact is her father Mr. Pardoen in Hengelo. I was quite surprised to find Sophia Pardoen on this (randomly chosen) page. After all, I have researched the Pardoen family and published the Pardoen family tree on this website. A Google search for Sophia Pardoen will indeed lead you to my Pardoen family tree, with information on Sophia's ancestry and siblings. Franciscus van Valkenburg (31, born Oss), his wife Geertruida (33, born Mill), and their son Franciscus (3, born Berchem). Last residence is Berchem, contact address is Geertruida's mother Mrs. Wagemakers in Oss, destination is Geertruida's brother G. Wagemakers. Genlias has their marriage record: Franciscus van Valkenburg, born Mill en Sint Hubert, and Geertruda Johanna Wagemakers, born Oss, married 1 May 1906 in Oss. Parents are Johannes van Valkenburg and Johanna Gommers, and Justinus Wagemakers and Geertruida de Groot. Genlias and the website of the Brabant archives, BHIC, will probably have more information on their ancestry. Note that Ellis Island and Genlias have the birth places of Franciscus and Geertruida reversed: I would expect Genlias is correct, but you should check their birth acts to be sure. 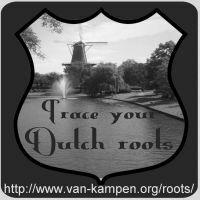 Let me know if the information helped you trace your own immigrant ancestors into The Netherlands, or share your experiences with the users of this website.